Try out these delicious recipes which are so quick and easy to make. You’ll be amazed at how good they taste and they’re full of essential nutrients! Cut eggplants length-wise and scoop out centres. Put eggplant shells aside and dice the flesh. Cook the barley flakes in a pot with a cup of water until soft then set aside. Heat a fry pan, add some olive oil, then cook eggplants, onions, garlic, tamari, stock and lemon juice , until the eggplant is starting to look transparent. Remove from heat. Heat another pan then toss the seeds until they start to brown. Add to eggplant with diced capsicum. Save a little bit to garnish. Combine these ingredients in a bowl. Heat the griller and cook the eggplant shells until they start to brown. Fill each shell with the mixture and place in a hot oven for 15 minutes. 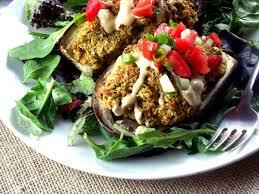 Put some fresh sprouts on top of each eggplant and serve with a tossed green salad. Mix dry ingredients including yeast in a large bowl. Add warm water and mix to form a soft dough. Knead until the dough is smooth and elastic. Cover the dough and leave in a warm place to rise for approximately 20 minutes. With oiled fingers, pat the dough onto pizza tray to form the base. Bake for approx 10 minutes in a hot oven (250-250°C) depending on whether your oven is fan-forced or not) and cook until light brown then add your favourite toppings and cook for a further 10 minutes. Whisk half of the Besan flour with enough water to make a thick paste, add salt, cumin seeds and baking powder. Heat a non-stick pan. Add a few tablespoons of coconut oil and drop a heaped teaspoon of the mixture into the oil. Cook until golden brown. Set aside. Whisk the remaining besan flour in a bowl, with the coconut milk, salt, chilli paste and turmeric. Put a little coconut oil in the pan and pour in the mixture. Cook on medium heat. Keep stirring constantly until the mix begins to thicken. Add onions and potatoes and simmer until the potatoes are tender. In another pan, place the cumin, mustard and fenugreek seeds and heat until they start to pop. Keep a lid on the pan. Add this to the curry. Add dumplings and simmer for a few minutes. Serve with rice and Indian bread or pappadums. Brush the vegetables with a mixture of tamari, sesame oil, minced garlic and lemon juice. Place on a baking sheet and roast in a hot oven for 20 minutes. Keep warm while cooking the crepes. Heat a non stick pan, add a little oil and pour in a 1/3 of a cup of the besan crepe mixture. Cook until the crepe is set and begins to bubble. Flip over and cook the other side for a minute. Place on a plate and keep warm in the oven. Spread a little pesto on the crepe, add the baked vegetables and serve. Great for lunch with a tossed green salad. Put the quinoa into a large bowl. Cover with water and stir well to wash the grain. Pour off the water and then repeat the washing process. You may also put the quinoa into a fine mesh strainer and rinse thoroughly. Sauté onion and garlic in a deep non-stick skillet with a little water until soft. Add the quinoa and saffron and cook, stirring, for another 2 minutes. Add paprika, cumin, cayenne, tomatoes, peppers, beans, and 2 3/4 cups vegetable broth. Bring to a boil, reduce heat to very low, and cook covered for 15 minutes. After 15 minutes, check to see if more broth is needed. If it looks dry, add the remaining vegetable broth. Place the zucchini on top of the quinoa and re-cover. Cook for about 5 more minutes, until quinoa is done. Remove the cover, stir in the peas, and cook uncovered until peas are warm and all liquid is absorbed, about 5 minutes. Arrange the artichoke hearts on the top and serve. Boil a saucepan of water, add rice and cook for 15 minutes then turn off heat and allow to soak up the remaining water for 30 minutes. In the meantime put a little oil, tamari, ginger, herbs, spices and lemon juice in a pan and toss. Add onion, celery, zucchini and drained rice then cook for 5 minutes. Add a little water to the pan if necessary then simmer for a further 5 mins. Just before serving add grated carrot and coriander. Preheat oven to 190°C. Rub sweet potato halves with oil, then put them cut side down on a baking sheet. Bake for 30 minutes or until soft. Turn oven off and preheat grill until medium hot. Turn each sweet potato half over and lay cheese and tomatoes on top, alternating the two, to cover the whole top. Pop baking sheet under grill and cook for 10 minutes or until cheese is bubbling. Drizzle balsamic vinegar on top and serve with a fresh green salad. Rinse quinoa well and cook for 5 mins. Slice zucchini and capsicums into thin strips and place on baking tray. Drizzle with coconut oil and balsamic vinegar and place under grill until browned. Grill haloumi slices until browned. Steam broccoli. In a large bowl place kale or spinach leaves, herbs, chopped sundried tomatoes, steamed broccoli, grilled zucchini and capsicum, haloumi, and cooked quinoa. Season with salt and pepper and drizzle with flaxseed oil and lemon/lime juice. Top with sliced avocado. Preheat oven to 220 deg C. Mix all ingredients for crust in food processor. Slice eggplant and zucchini into medium-width slices then fry in oil for a couple of minutes on both sides. Drain on paper towel and season. Place half the eggplant slices on baking tray and cover each with pine nut mixture. Add zucchini slices, goat’s cheese, tomatoes, basil and finish with eggplant slice on top. Bake for 10 minutes. Garnish with basil leaves, salt and pepper. Blend the almonds with the water to make a thick almond cream then strain through a nut-milk bag or linen cloth. Blend 1 cup almond milk with the Irish moss until very smooth. Add the remainder of the ingredients and blend until smooth. Pour into container and freeze overnight. Let thaw about 5 minutes before serving. Variations: Replace water with any nut milk or flavoured teas such as peppermint, orange or berry. You can also blend in some raw cacao powder (1/4 cup) or 1/2 cup of fruit or berries. Combine all ingredients in a bowl. Lightly oil a baking tin and put a spoonful of mixture about an inch apart. Bake in a hot oven until golden. Allow to cool.